We used SuperValu essentials rectangular roasting tin (34.5 x 24 x 5.5cm). No need to line the tray, just brush with Rapeseed Oil. You can also use tinned peaches as a quick and easy alternative. Preheat oven to 170°C/340°F/Gas Mark 3. Grease a deep tin the same size as a baking tray with rapeseed oil. Plunge peaches in boiling water and leave for about 4 minutes and remove the skin. Combine all the dry ingredients in one bowl. In a separate bowl combine all the wet ingredients. Add the wet to the dry ingredients, and gently fold together. 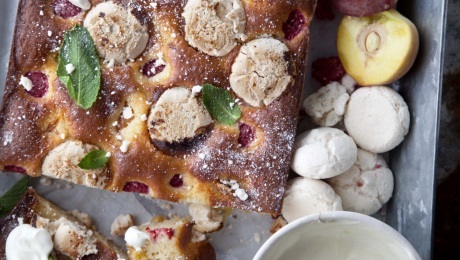 Quarter the peaches and remove the stone, top the cake mix with mini meringues, peaches and raspberries. Cook for 22 minutes or until skewer comes out clean.